Somehow Anna Belle and her family found the Cotton Bowl. UPDATE: A person commenting on Facebook says that he thinks this shows “Cedar Mountain, near where Joe Pool Lake was built” — an area which actually is within the Dallas city limits. I’m not familiar with that area. Does this postcard show this view? 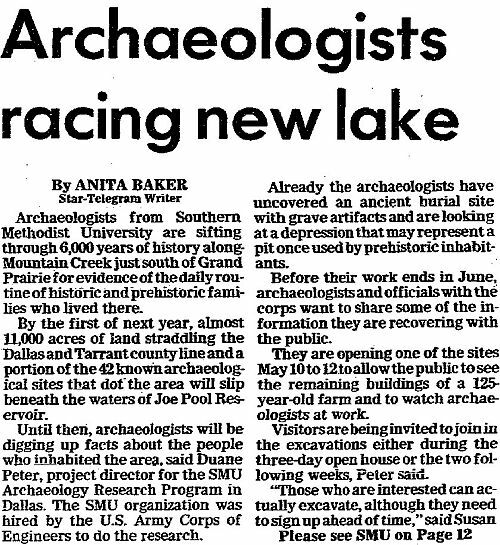 Read about the Cedar Mountain Preserve here; and about Joe Pool Lake here. Check out a map that shows the City of Dallas boundary, here. Read about Cedar Mountain (“…that wooded white rock ridge that runs from Eagle Ford to Cedar Hill…”) in the Dallas Morning News article “Bear Slapped Him But He Survived” by Kenneth Foree (Sept. 1, 1948). 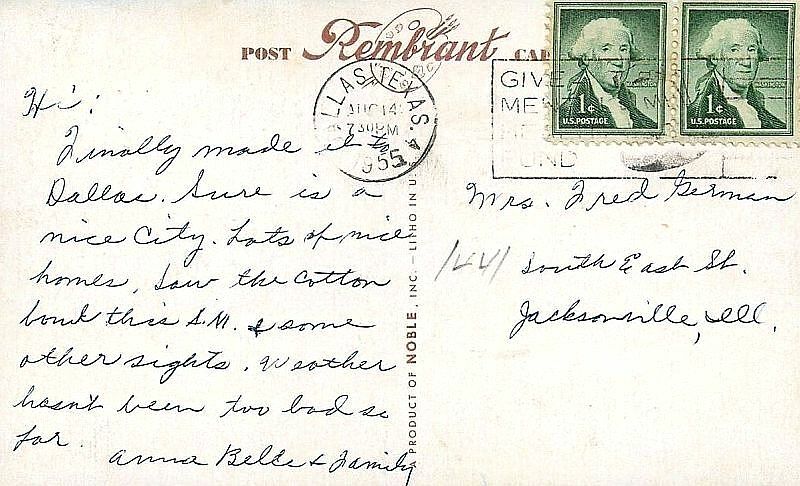 Apologies, Cedar Mountain and Rembrant (sic) Post Card Company, if I have made unfounded sarcastic comments. UPDATE TO THE UPDATE: I have to admit, nothing I’ve posted before has stirred up quite so much controversy. This post has been shared quite a bit, and I’ve dipped into Facebook pages where members are discussing this idyllic photo. Half swear up and down there’s no way this could be anywhere near Dallas, and the other half are pretty certain it’s in the Cedar Hill area. The Old Penn Farmstead was a working family farm/ranch from the 1850s until the 1970s (remaining in the Penn family the entire time). 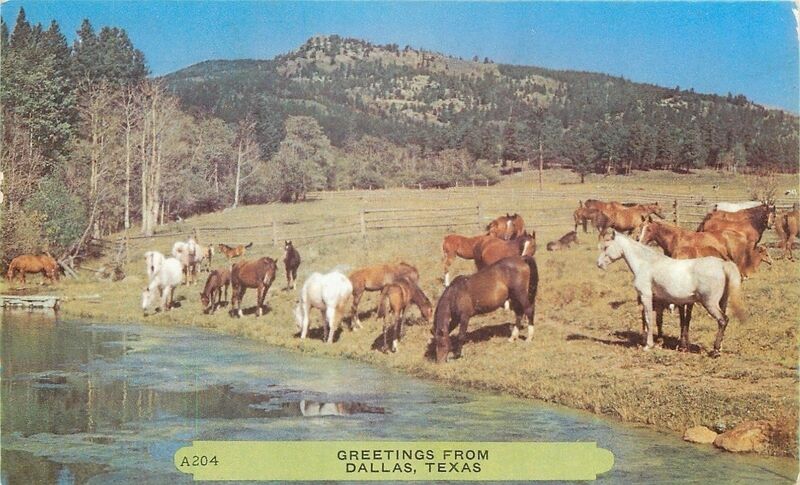 Photos show that the fence construction on the Penn property is the same as that seen behind the horsies in the postcard. The photo may have been taken on Penn land or other land in the same area. There were several large-ish farms and ranches nearby, several of which had horses. 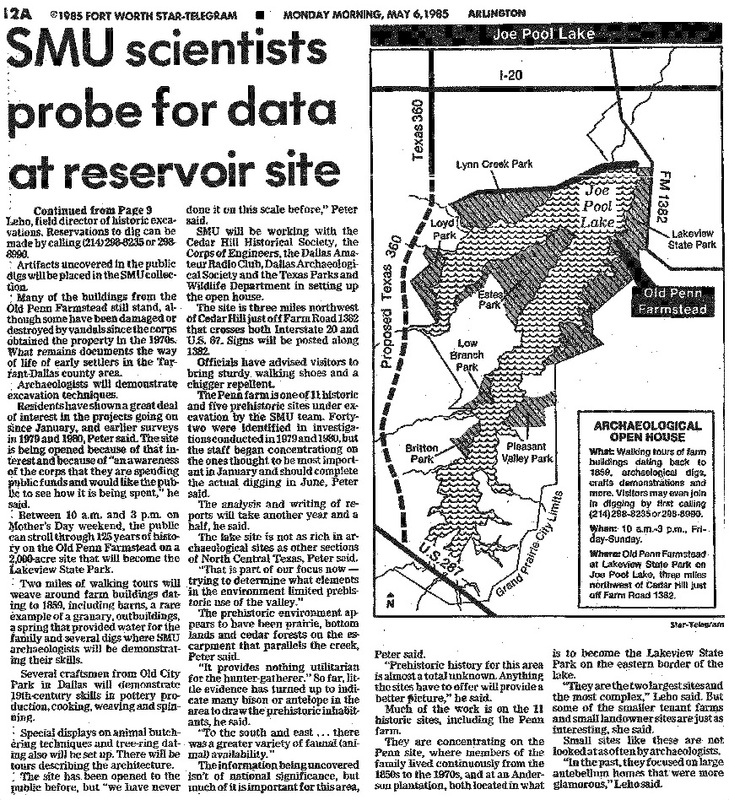 There were even a couple of “retreats” operating in the area in the late-1940s and ’50s (notably, the 520-acre retreat sponsored by the Dallas Baptist Association). Even though it’s possible this was just some sort of stock Western-looking photo used by the postcard company, I’m leaning toward it showing the unexpected beauty around what is now the Cedar Hill State Park, Cedar Ridge Preserve, Cedar Mountain Preserve, Dogwood Canyon Audobon Center, Joe Pool Lake, Mountain Creek Lake, etc. Watch a short Texas Parks & Wildlife video about Cedar Hill State Park here; the Penn Farmstead is located here and is seen in the video. UPDATE TO THE UPDATE OF THE UPDATE: It appears that the Rembrant Post Card people will tell you whatever you want to believe! The same image has been found without “Dallas” but with “Colorado” on it (see link in comments section). Horrors! So, anyway. After all that, my original sarcastic tone stands. Always trust your inner cynic! At least I learned about Cedar Hill! UPDATE, ETC. : And now this saga has been taken on by intrepid Dallas Morning News reporter Charlie Scudder! Read his coverage, here. 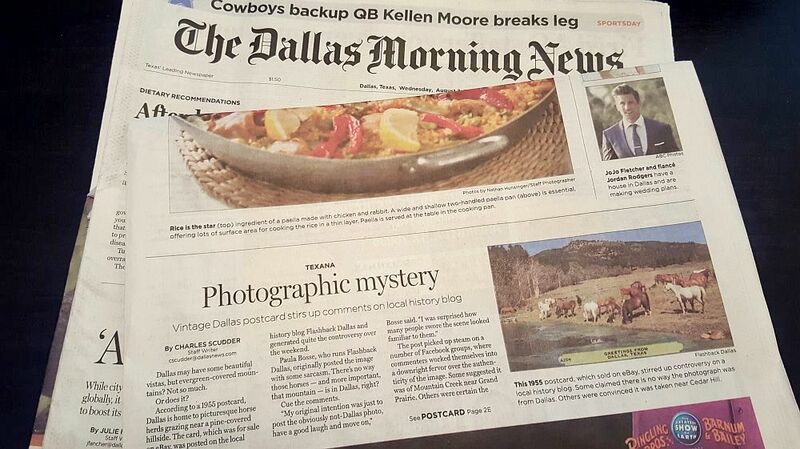 UPDATES, INCORPORATED: And, somehow, this story ended up in the pages of the actual paper edition of The Dallas Morning News. Lordy. I recognize that spot! That’s White Rock Lake with Flagpole Hill in the background. HA! That’s great! Thanks! Looks like we can’t trust the Rembrant people. This is good additional information Paula and like I said yesterday this could very well be a scene from far southwest Dallas county, but I would think we would be seeing more Cedar and Mesquite trees in the distance. There are several hills out that way, but if this post card is from 1955 then I doubt it was a shot of the actual 880′ Cedar Hill that in 1955 was dubbed Tower Hill. In 1955 the first of what would become about 14 radio and TV towers was built on top of the highest point out there in Cedar Hill, Texas. There are some nice hilly vistas out in that part of the county for sure. Several are just south of Cedar Hill and just west of Boy Scout Camp Wisdom. Back in the late 1950’s and early 1960’s we would hike across Atresian Creek and out of Camp Wisdom property over to a hilltop we called Sharks Tooth Mountain. This was way before Spur 408 and I-20 cut up that part of the county. I think Spur 408 took out a good portion of Sharks Tooth Mountain, but back in the day you could scoop up scores of sharks teeth by just moving a little top soil. There was also a great view of Mountain Creek Lake from this hilltop. Like I said, there are some very pretty vistas out in that part of the county so this post card may have very well captured one of them. I’m still curious about the trees. Very interesting topic for sure! The Morning News or TImes Herald had a good article about the Penn Farm just before the area was flooded to form the lake. I read that. I can’t believe I’d never heard of it before!